This next “Divine” Holiday Treat — Baklava — is the perfect accompaniment for a champagne toast at midnight. It’s even better if you plan to have guests join you for the countdown to 2014. Give it a try and you’ll be singing Auld Lang Syne in no time! Here’s a “secret:” I love baklava, but I don’t love all of the time and effort that goes into making it the traditional way. Surprised? My version is a quick and easy take on this beloved Greek classic. 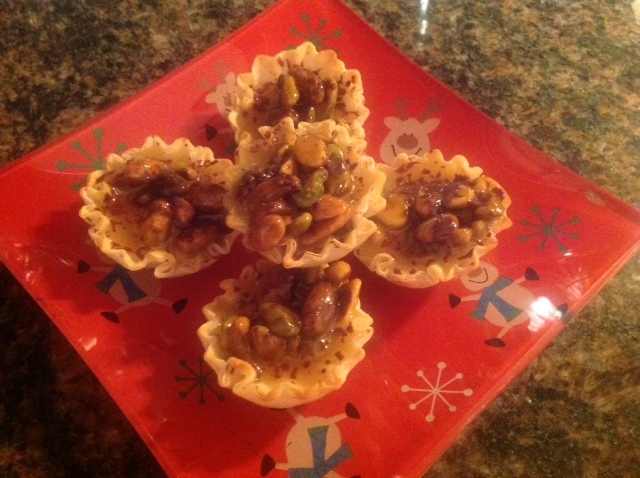 Instead of sheets of phyllo dough, I’ve substituted prepared phyllo cups. (You can find these in the frozen section of the grocery store and they come 15 to a package. Just thaw out for about 10 minutes on the counter while you prepare the filling, and you’re good to go). 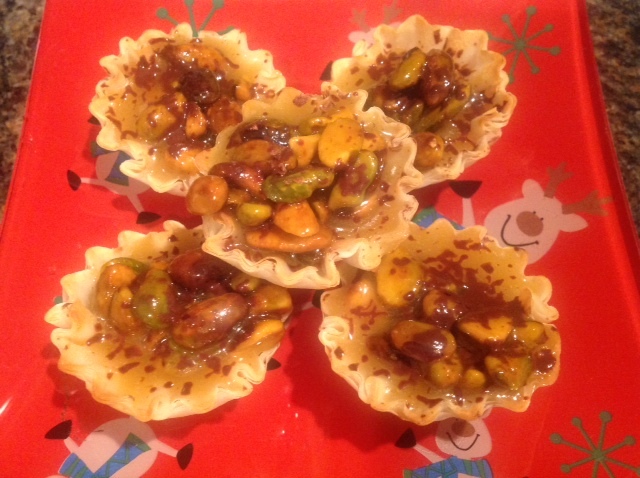 Now, traditional baklava doesn’t have any chocolate, but this *is* a “Divine” Holiday Treat. Just shave some Divine Dark Chocolate over the cups for a festive — and deliciously rich — topping to these buttery bite-size wonders. 1. Line a baking sheet with tin foil. 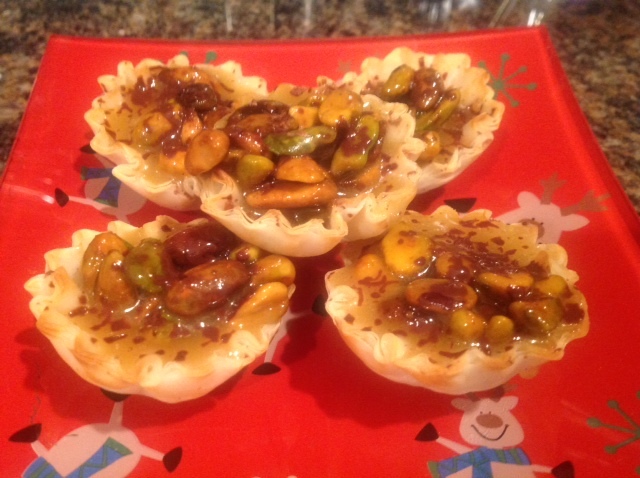 Arrange 15 mini phyllo shells in 3 rows. 2. In a saucepan, melt butter over medium heat. Add nuts, honey, sugar, lemon juice, lemon zest, cinnamon and salt to saucepan. Cook, stirring until thick, about 5 minutes. 3. Using a teaspoon, fill the phyllo shells with the mixture. Let stand for a few minutes before serving, as mixture is hot. While cups cool, shave Divine Dark Chocolate over top with a zester.